Take the guesswork out of serving pizza at your next party by considering serving sizes and toppings to accommodate your guests. Serving pizza at your next party can be simple or intimidating. For children, the obvious choices of cheese and pepperoni toppings will more than likely satisfy the little ones. 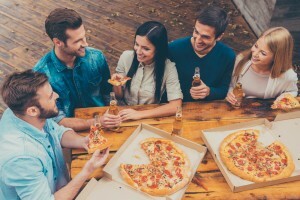 Planning a pizza order may be a bit more complicated for an adult or mixed-age gathering, but some careful thought and simple calculating may help ensure that vast majority of your guests do not leave hungry. First Things First: How Many Slices Do You Need? For small children, you should plan on two slices per child. Older kids and adults are a bit more difficult, as appetites can vary tremendously from person to person. However, in general, it is safe to assume three pieces per person. For either age group, and depending on the size of the gathering, it might be a good idea to throw in an additional pizza or two for insurance. Most people love pizza, but their choices of toppings may vary from guest to guest. It is important to remember that it is not reasonable or expected to cater to everyone’s specific palate, but providing at least a small variation of pizza choices will ensure that most bellies will be satisfied. Adults tend to be more adventurous with meals and like to try new things, so mixing up the pizza toppings with a variety of meats, veggies or specialty ingredients should not be avoided. For a mixed crowd, it might be wise to include at least one or two simple pizza choices, with just cheese or one topping, as well as a veggie style pizza for vegetarians. Of course, if you know that more than one of your guests is a vegan, a dairy and meat-free pizza will score you extra host points. Take a few moments to consider your guests’ ages, appetites and special food considerations, but it is not necessary to spend hours agonizing over your pizza order. You can plan ahead and order your pizza delivery for 89101 early, then forget about the food and enjoy your party!